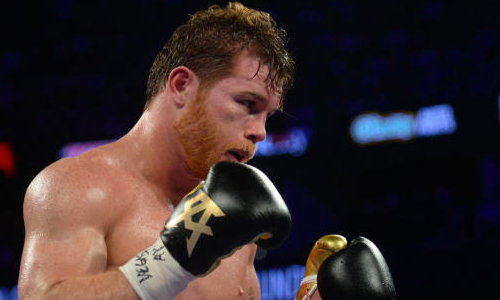 If Saul ‘Canelo’ Alvarez latest social media activity is anything to go by, he isn’t taking Daniel Jacobs lightly at all. The Mexican superstar went through a grueling session at the gym before taking to his official Instagram account to share a picture with his 4.5 million followers. Canelo can be seen working his jab on a punching bag, which snapped after he unleashed a couple of right cross (no wonder, he has 35 knockout wins under his belt). After prevailing over middleweight king Gennady ‘GGG’ Golovkin, Canelo moved up to super middleweight to face British prospect Rocky Fielding in December last year. The 28-year-old proved he belonged right at the top by stopping Fielding in three rounds. It remains to be seen if Jacobs (35-2, 29 KOs) can halt Canelo juggernaut when the duo locks horns for the IBF, WBA and WBC belts in Las Vegas on May 4.